Last year's Wimbledon saw all the big names tumble out early on, leaving the field open for Marion Bartoli to come through to win her first ever grand slam title against Sabine Lisicki in the final. If she plays to her best, this title will be Serena Williams', but there are growing doubts surrounding her game and if she slips up, there are plenty of players waiting to lift the title. In this article, I look at 20 of the seeded players that could fancy a chance at a run to the title and one unseeded player that is always a dangerous outsider to be avoided at Wimbledon. Prediction: She is by far the best player in the women's game and if she plays to her ability, she is unbeatable. However, she has suffered some unexpected defeats this year and one might begin to wonder whether the intensity and motivation is still there given that she has won everything there is to win during the past few years. She will have one poor match during the tournament - if her opponent can make the most of it, then she is beatable. Otherwise, she will be lifting her sixth Wimbledon title. Prediction: Grass is not a surface that Na Li has thrived on in the past. While she has no clear weaknesses on the surface, she is not outstanding in any particular areas, which means that she often comes up short against the better grass court players. If she can avoid any specialists, she has a chance of a decent run, but it seems unlikely that she will be lifting the title. Prediction: Simona Halep's improvement over the past twelve months makes it slightly difficult to judge her based on previous statistics, but she will need a big improvement on grass if she is to really challenge her and back up her run to the French Open final. She has always had a solid return game on grass, but she really needs to improve on her own serve if she is going to avoid throwing away the hard earned leads that she creates through her excellent break point conversion rate. She could go well, but it would be a monumental leap forward if she wins the title. Prediction: She should have reached back-to-back Wimbledon finals last year, but threw away the match against Lisicki in the semi-final. She is excellent on return and uses her game well to protect her second serve. She does very well at fighting off break points, but the lack of easy service points means that she will have to grind her way through the tournament. She has done that before, but she is always vulnerable to the big hitters. Prediction: Sharapova won this title ten years ago and it is slightly surprising that she has not won it again since then. Her return game is as good as any and she protects her serve very well, both winning plenty of first serve points and limiting the number of break points that she faces. With the exception of last year, she rarely loses to anyone other than the very best and with the lack of truly outstanding players at the moment, there is every chance that she could go very well again this year. Prediction: The 2011 champion will be hoping for another good run this year. She is strong behind her serve and her return game is good enough to create chances for her to break. There is a slight worry about her fitness after she withdrew in Eastbourne this week, but that seems to be precautionary, so one would expect her to be fully fit next week. Always a threat if her serve is working well, she could go well, but she can be very unpredictable at times. Prediction: Jankovic has reached the second week a number of times, but without getting any further than the Monday. However, she has struggled in recent years, twice going out in the first round and once in the second round in the last three attempts. 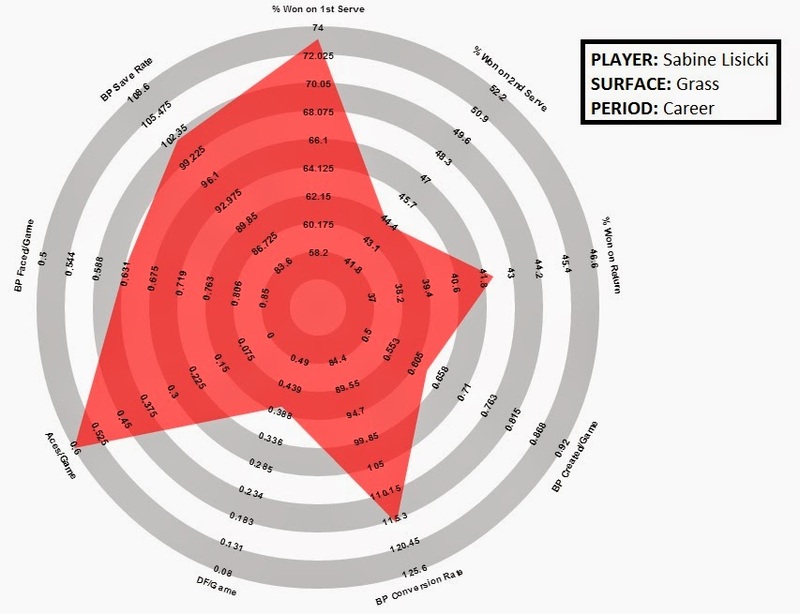 She relies on her return game as her serve can often prove too weak on grass - the second serve in particular is below average and can result in too many double faults being given away. Her preparation for this year was less than ideal, with a first round defeat in Eastbourne as the third seed meaning that she has little practice on grass this year. No disrespect to Jankovic, but she is the player that the top four seeds will be hoping to draw from the 5-8 seeds bracket. Prediction: Over the past few years, Azarenka has firmly established herself as the closest contender to Serena Williams. Her return game is outstanding, she uses her first serve and rallying ability to limit the break points that she faces and she creates plenty of break point opportunities for herself. The second serve is a real weakness though, but she will attempt to protect that by getting plenty of first serves in play. She has only been beaten by the very elite players in the past few years at Wimbledon - Serena in 2012 and at the Olympics and Petra Kvitova in 2011. Last year, she picked up an injury in a first round win over Koehler that forced her to withdraw. The major worry is that she has only just returned from a foot injury that has hampered her year, but if she gets a kind draw to ease herself into the tournament, there is no reason that she cannot do well here. Prediction: A semi-final two years ago marks Kerber's best performance at Wimbledon. Her problem is that she is solid in most areas, but there are no areas that mark her out as a serious title contender. 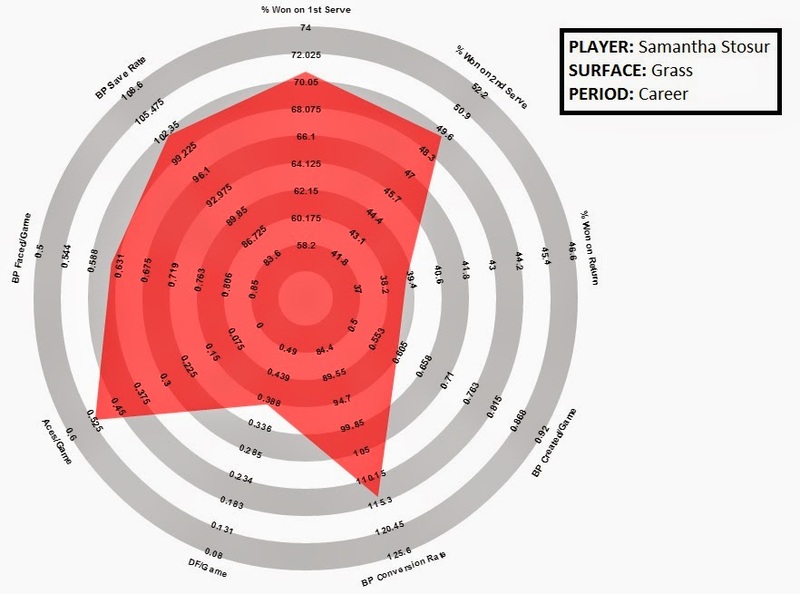 Her return game is comfortably above average, she creates a reasonable number of break points, but her serving statistics are nothing more than average. However, she is currently enjoying a good run at Eastbourne and if she gets a reasonable draw, there is no reason that she cannot have a good run at Wimbledon. 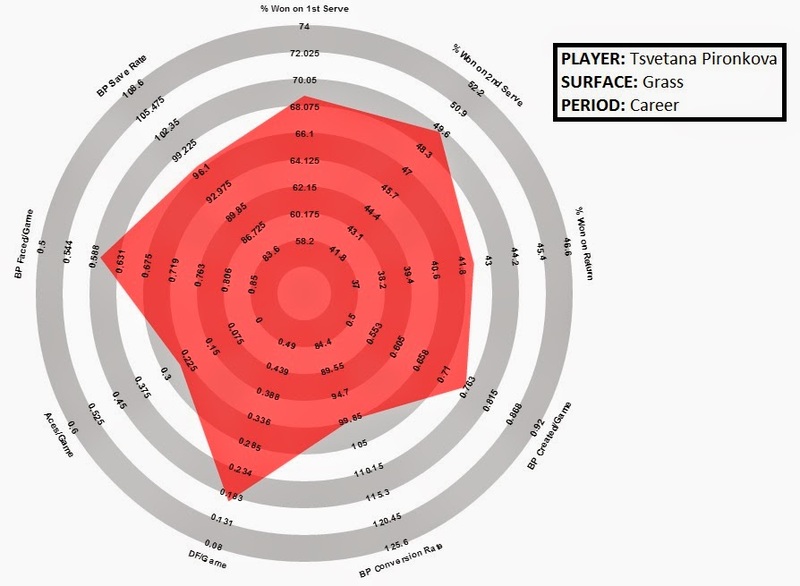 Prediction: Grass has never really been a surface where Cibulkova thrives. Her best performance was a quarter-final three years ago, but that is the only time that she has reached the second week and it would be a surprise if she changed that this time around. Her serve is a major weakness on grass as shown by the fact that both her first and second serve win percentages are below the WTA average, let alone the level that would be needed to challenge here. 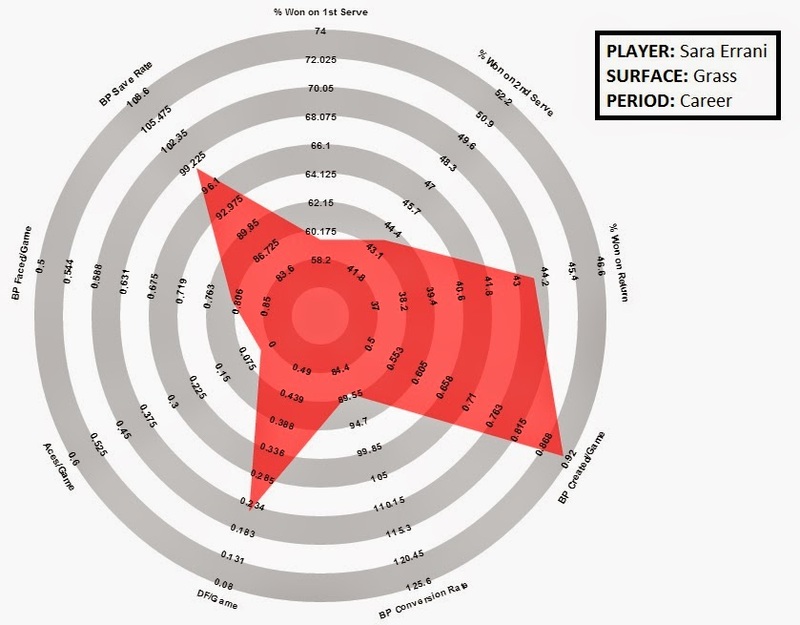 Her returning is slightly above average, but this is unlikely to be enough to compensate for her serve. Certainly a player that the top names would like to see in their section. Prediction: Fresh off a first grass court title, Ivanovic is arguably playing as well as she has done for many years. It is a long time since she reached the semi-final as a 19-year old, but there are growing expectations that she could be set for another run here. Her first serve is very effective on grass, her second serve and return games are above average and there are few clear weaknesses in her game. Grass has long been her worst surface, but she has a reasonable chance to do well this year. Prediction: Pennetta has reached the second week on several occasions, most recently last year having started the tournament as an outside to beat the late Elena Baltacha. She has a solid all-round game without being outstanding in any area. 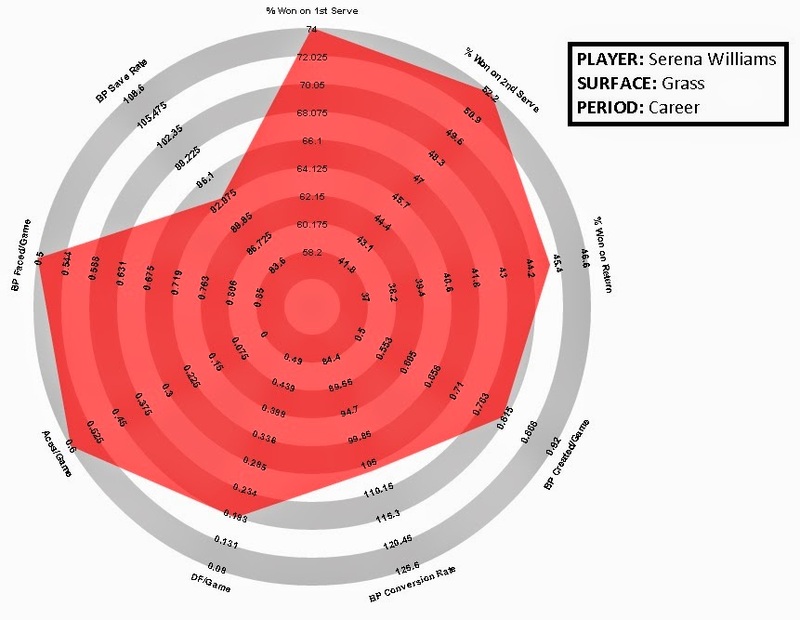 Despite an above average serve, she does allow too many break points against her and the way that she fell apart against Heather Watson in Eastbourne raises a few questions about whether she really has the game to challenge here. A tough opponent, but one that any real contenders should expect to come through without too many problems. Prediction: Bouchard has been the most consistent Grand Slam player this year, reaching the semi-final in both Australia and France. She reached the third round last year on her first attempt and is a former Wimbledon junior champion. She was disappointing against King in s-Hertogenbosch this week, but it felt like she was just there for a bit of practice ready to save herself for Wimbledon. 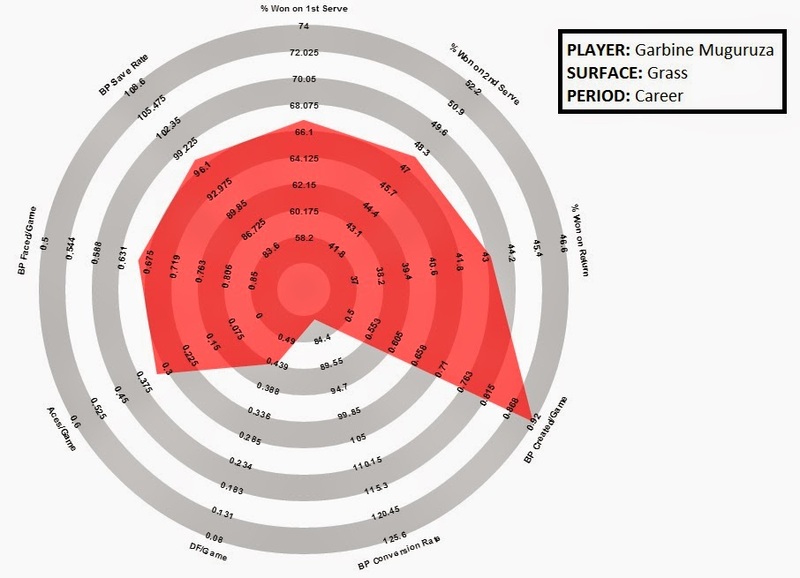 The sample for her statistics is below the minimum that I would usually use, so it is difficult to put any real faith in the radar, but she does have the ability to go far and she has plenty of drive and confidence in her own ability. It might be too soon for her to win this year, but she has the ability to worry any of the top contenders. 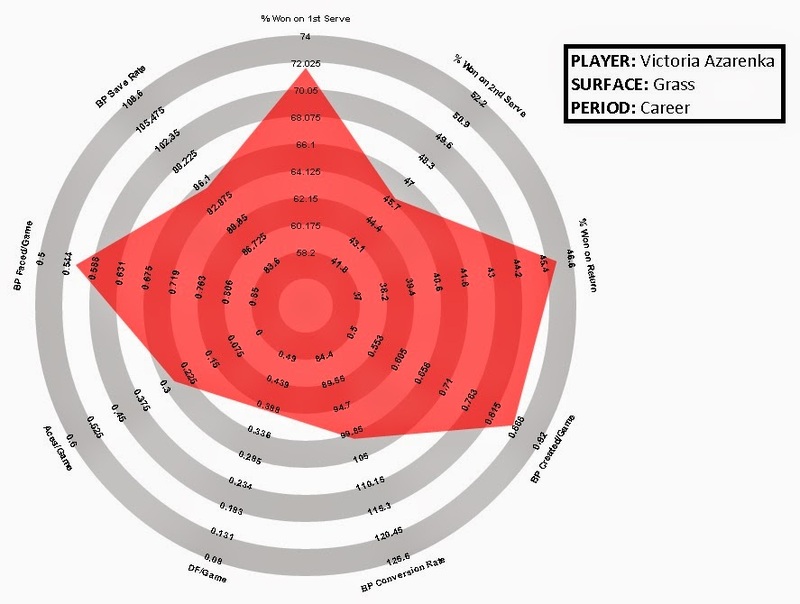 Prediction: Her return game and break point creation is still good on grass, but her serve is hugely exposed on this surface, which is why she will never succeed at Wimbledon. Given her poor serve, she has to take advantage of any opportunities to break and her substandard break point conversion rate is a clear sign that she does not do that. She has lost her last four matches on grass in straight sets and any top players will be delighted to see her in their section of the draw. 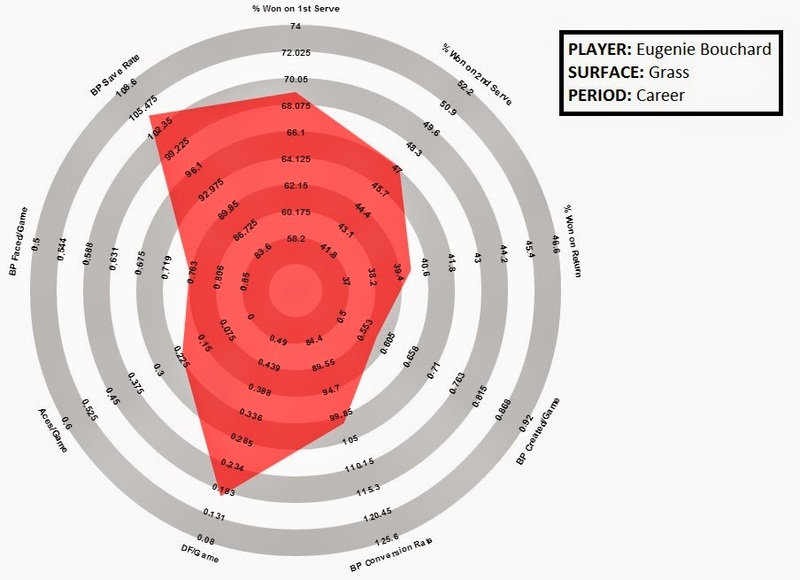 Prediction: Her radar looks impressive, so it is possibly surprising that Wozniacki has never been past the fourth round at Wimbledon. Her second serve win percentage is close to world-class, her return game and break point creation is very impressive and she does not face many break points on her own serve. The worry is the inconsistency that has crept into her game ever since she made it to the number one spot and with her lack of power to hit winners, if she cannot get enough balls back in court, she will struggle. She is currently enjoying a good run at Eastbourne and a run to the second week at Wimbledon is certainly not out of the realms of possibility. 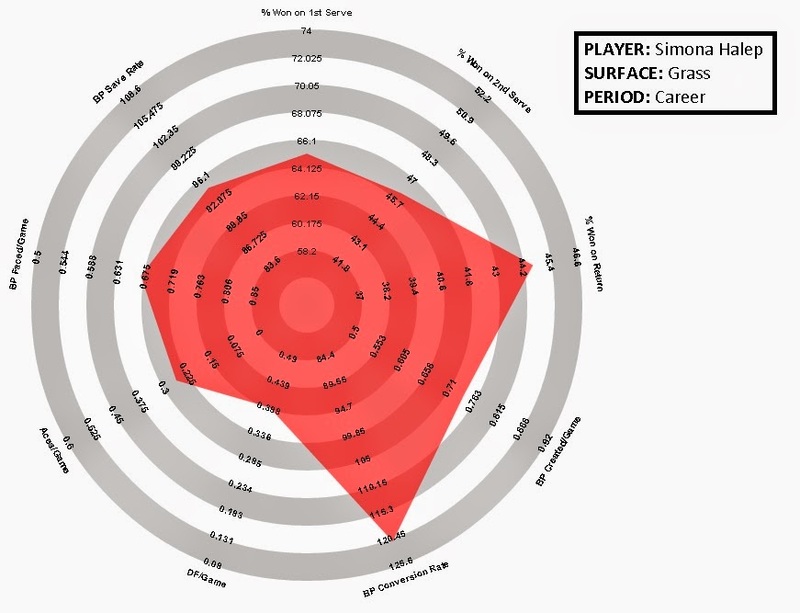 Weakness: Very poor on return and struggles to create break points. Too many double faults as well. Prediction: Sam Stosur is yet to make the second week of Wimbledon. While she is strong behind her serve and on the break points both for and against, her returning is a major weakness and means that she very rarely is able to get back into sets where she has fallen behind. She also has a tendency to fall apart after a good start, as we saw in the French Open against Sharapova. Last year at Wimbledon, she won the opening set against Lisicki, but won just three further games in the match. Two poor showings at Eastbourne and Birmingham in the warm-up events does not fill you with any confidence that she might chance her poor record at Wimbledon. Prediction: Sloane Stephens somehow scraped her way through to the quarter-finals last year despite seemingly being second best in almost every match. 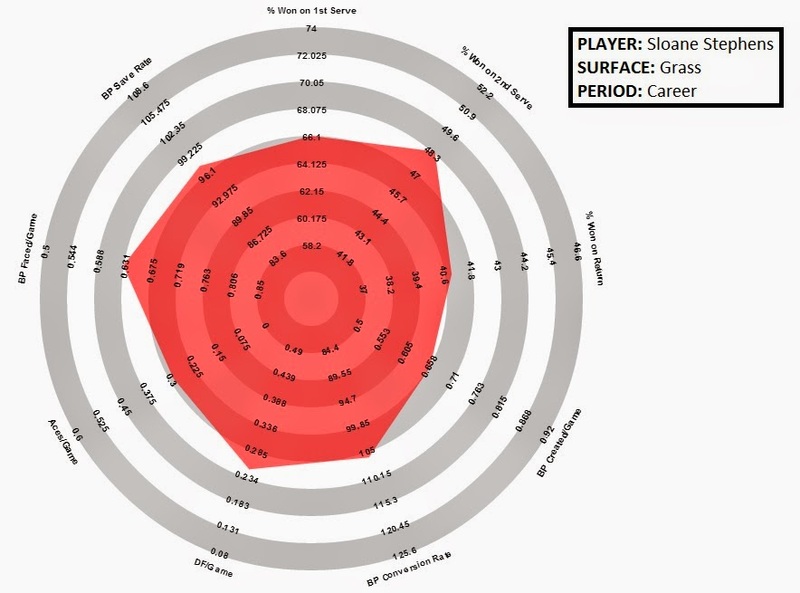 The radar suggests that she has no real weaknesses in her game, but also that there is no category where she is any more than slightly above average. She usually saves her best tennis for the Grand Slam events, which is probably for the best given she was pretty average during her matches at Eastbourne and Birmingham. She will scrap her way through a match or two, but it is tough to see her really challenging any of the serious contenders for the title. Prediction: Sabine Lisicki always comes alive at Wimbledon as shown by two quarter-finals, a semi-final and a final in her last four appearances at the event. She has an excellent first serve, which gives her plenty of cheap points, she is very strong at saving break points on her own serve and converting break points when she gets the opportunity. The major weaknesses are her return game and especially her second serve. On her day, she can beat anyone as demonstrated by wins over the likes of Serena, Sharapova, Radwanska and Bartoli in recent years at Wimbledon, but her form this year has been awful and she has not played a warm-up tournament. She is dangerous to write off at Wimbledon, but there are few signs that her form is good enough for a repeat of last year. Prediction: She has done well to come back from injury and had a good run in Paris, but has rarely shown her best tennis at Wimbledon. She pushed Sloane Stephens last year and really should have won that match, but fell just short. 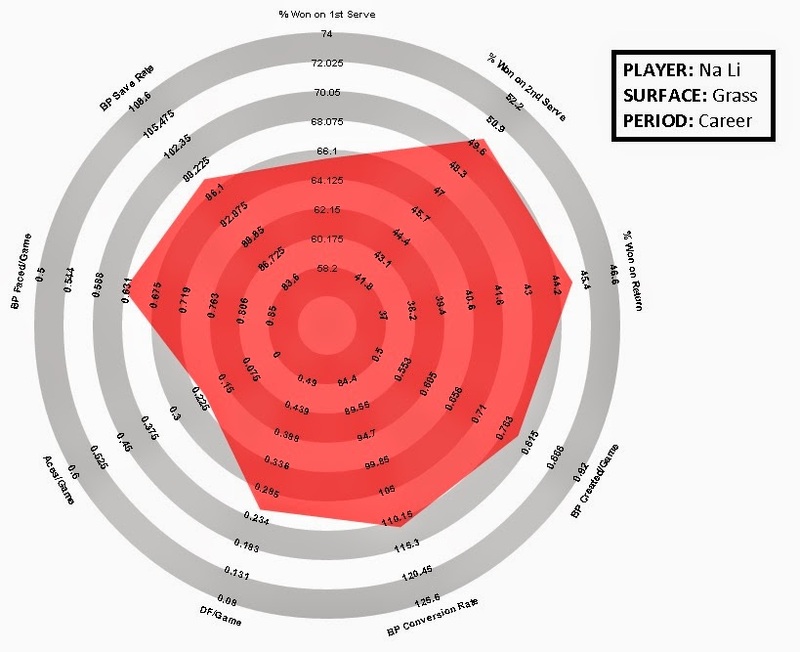 Her second serve, break point limitation and break point conversion rate are her best attributes, but despite a slightly above average return game, she struggles to create break point opportunities or to save break points on her own serve. Again, a potentially dangerous opponent on her day, but not likely to really challenge later in the tournament. Prediction: One of the stars of the French Open, having eliminated Serena Williams and pushing Maria Sharapova to the limit, she will be hoping for another good performance here. She showed glimpses in s-Hertogenbosch last year that she has the game to play on grass and she is now fully-fit having taken time out during the second half of 2013. Her break point creation is world-class in the admittedly small sample of matches, although she struggles to convert those break points. Other than that, her all-round game is solid and she is improving by the week. Probably too soon for her to challenge for the title here, but as she showed in Paris, she has the ability to seriously trouble the top players on any given day. 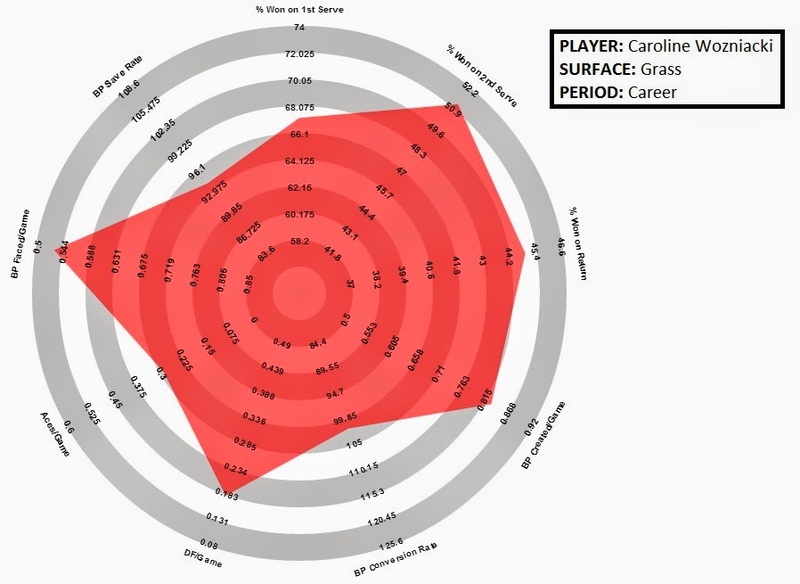 Prediction: Pironkova is a strange player that only seems to come alive once each year - at Wimbledon. A semi-final in 2010 where she lost to Vera Zvonareva and a quarter-final in 2011 losing to Kvitova showed her ability. She took a set of Sharapova in 2012 and was only beaten by Radwanska last year. She has a very good all-round game with no clear weaknesses and will always be a threat to any player at this tournament.